Saint Louis hasn't made an NCAA Tournament since 2014 and probably wasn't going to this year under second-year coach Travis Ford, although the Billikens are much improved. Part of that is due to freshman guard Jordan Goodwin, who was averaging 11.5 points, 7.5 rebounds and 4.0 assists - he had the school's first-ever triple-double not long ago. Alas, Goodwin's season is now over as he has been found in violation of school policy related to the university's Title IX investigation. Long story short, some women accused four players of sexual assault in September. All the players were allowed to practice throughout the preseason and regular season, but Goodwin was the only one allowed to play in games. He had been found innocent of sexual assault in the investigation, but perhaps his punishment finally came down. Goodwin, a Top 50 recruit, will return to the program in May. Atlantic 10 Conference game at 7 p.m. ET on ESPN2. I'm sure glad Rhode Island is good this year because otherwise there would be no ranked teams to look at on Fridays for this story. 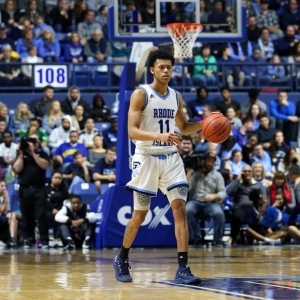 The Rams are 13-0 in the A-10; the only other teams unbeaten in conference play around the country as of this writing are Vermont, Cincinnati (which I picked to lose Thursday night in Houston), Florida Gulf Coast, Montana and New Mexico State. It's impressive to go unbeaten in conference play, no matter what level. Rhody brings a 16-game winning streak into this one off an 85-67 home win over Richmond on Tuesday. However, star senior guard E.C. Matthews left in the first half with a knee injury and didn't return. That could be catastrophic as two of Rhode Island's three losses - to Alabama and Virginia - occurred while Matthews was out early in the season with a wrist injury. St. Bonaventure would greatly improve its potential NCAA Tournament at-large chances with an upset here - ESPN's bracketology currently lists the Bonnies as among the "First Four Out." In nonconference play, St. Bonaventure beat Maryland, Vermont, Buffalo (best team in the MAC) and Syracuse. It is second in the A-10, albeit four games back of Rhode Island. The Bonnies are on the school's first seven-game Atlantic 10 winning streak in program history. They lost at Rhode Island on Jan. 13, 87-73. Matthews had 20 points with nine rebounds for Rhode Island, which led only by three at halftime. However, the Rams came out of the break on a 14-1 run and never looked back. Key trends: The Rams are 10-3-1 against the spread in their past 14 road games. The Bonnies are 5-2 ATS in their past seven at home. The home team has covered four straight in the series. MAAC at 7 p.m. ET with no national TV but can be streamed on ESPN3. OK, you might be asking why I'm previewing a Metro Atlantic Athletic Conference matchup between two schools you probably don't know the location of. Three reasons: 1) Fridays are slow around NCAA basketball; 2) You can bet on it; 3) This might have great value on the underdog. Canisius is tied for the MAAC lead with Rider at 12-2 (best start in school history, and this marks just the third time in program history where Canisius has won 12 or more MAAC games); ESPN projects Rider to earn the automatic bid. The Golden Griffins won their fifth straight game on Monday, 81-63 over Fairfield. Canisius trailed by two early in the second half before outscoring the Stags 21-2 over a 10-minute stretch. I'm leaning a bad Monmouth team here. Yes, the Hawks lost 94-79 in Buffalo to Canisius on Jan. 14, but Monmouth led by as many as 13 early and was still up two at the half. The teams combined for 53 fouls and 72 free throws. I more like Monmouth in this spot because Canisius surely will be looking ahead to the MAAC Game of the Year Sunday at Rider. The Golden Griffins won the first matchup vs. Rider by a point, so another victory Sunday would all but wrap up the regular-season title and top seed in the MAAC Tournament in Albany. Key trends: The Golden Griffins are 10-4-1 ATS in their past 15. The Hawks are 1-4 ATS in their past five against teams with a winning record. The favorite is 5-2 ATS in the past seven meetings. The pick: This line flat-out shocks me how low it is. A few games ago, Canisius was -11.5 vs. a better Quinnipiac team (granted at home). I'll still stick with Monmouth. It's the Horizon League Game of the Year at 9 p.m. ET on ESPNU. First-place Northern Kentucky, the defending conference champion (it was the school's first-ever NCAA tournament berth) leads Wright State by a game, and there are only three remaining after this one. Wright State won the first meeting, 84-81 in Kentucky on Jan. 11. Cole Gentry made a layup and followed with two free throws in the final seconds to clinch the victory. Grant Benzinger led the Raiders with 31 points as they broke the Norse's 13-game home win streak. Dantez Holland led Northern Kentucky with 22 points. NKU won all three meetings last year. The Norse have lost just once since, 83-70 at home to Oakland on Jan. 26. They are off an 86-80 win over Green Bay last Saturday. Drew McDonald recorded his 13th double-double of the season with 12 points and 15 rebounds, and his team missed just one free throw in 20 tries. McDonald is sixth in the league in scoring and second in rebounding. Wright State perhaps was caught looking ahead to this one as it lost at home to Milwaukee on Saturday, 74-73. Raiders freshman Loudon Love had 20 points and career-high 19 rebounds for his 11th double-double of the year. He leads the Horizon in rebounding and is Top 16 in scoring and will surely be named the Horizon League Freshman of the Year. Key trends: The Norse are 3-7-1 ATS in their past 11. The Raiders are 5-1 ATS in their past six vs. teams with a winning record. The underdog is 5-1 ATS in the past six meetings.